Talking chess, Chess, and color-blind casting with the artistic director of Little Tokyo’s most celebrated theater company. East West Players has always forged its own path. Founded in 1965, the Little Tokyo-based troupe was one of the first Asian American theater companies and was in the vanguard of color-blind casting. This spring the company takes on Chess, a Cold War musical about a love triangle involving an American and a Russian chess player. When it premiered on Broadway in 1988, Chess only lasted two months. The U.K. version that East West is mounting, which runs from May 9 to June 9, is closer to the earlier concept album. With an infectious score by ABBA’s Benny Andersson and Björn Ulvaeus and lyrics by Tim Rice, it produced the chart-topping hit, “One Night in Bangkok.” Tim Dang, who has served as the company’s artistic director since 1993, discusses why he chose this musical and his approach to the show. Why did you choose to stage the U.K. version, and how are you interpreting it? The U.K. version is more along the thought process that I had, and I like that the ending is a little open for interpretation. There’s the story of Chess — the relationships and politics during the Cold War – but there’s also a strong parallel of chess as a strategic game. We’re making decisions every day in our life, whether it’s about career or relationships, and everything becomes a strategic move. Everything becomes like chess. That’s why we added what we call the Spirit Dancer, who interprets the opening song, and the arbiter has more of a divine presence now. We think of him as the spirit of life, while she is the spirit of chess. They move between the realistic world and this fantasy world that we’ve created, manipulating what happens. And religion came out of our production discussions, because Merano, Italy, is probably Catholic or Christian; then you go to Thailand, and most of them are Buddhist. How do they each perceive the world? In terms of Buddhist philosophy, there is no judgment, while the Catholic side is all about judgment. It’s a very interesting juxtaposition and hopefully it’ll permeate the characters. Chess is often performed as a concert, rather than fully staged, because the chorus frequently sings during the soloist’s soliloquies. How did you handle that challenge? We wanted to keep as much of the chorus from the concert version in with the music, for dimension and complexity. We decided, maybe the chorus is lurking in the background of our set and they’ll come in at certain times, almost like the conscience of these characters. Something serendipitous happened when our Freddie was singing “Pity the Child,” and the chorus comes in at the end. We actually had people crossing the stage, in the dark, almost like lonely people passing but not connecting with each other. It was an interesting feeling in terms of what kind of childhood he had, an only child left alone. It became a surreal movement of lonely people crossing each other. Chess has a tumultuous history of rewrites and attempts that haven’t quite worked. Why do you think the show has lived so long? Why hasn’t it been abandoned? I think that there is this cult aspect to Chess. You’re dealing with Tim Rice, a pioneer in terms of the rock opera, and the group ABBA, and we’re marketing it as the first show from the creators of Mamma Mia, so I think there is this cult mystique about the show. I remember it, when I was around in the 1980s, from the song “One Night in Bangkok,” when MTV and music videos were the things to watch. That’s why I appreciate Chess so much. It really has this ’80s feel, and hopefully we’ll give it an edge so that it’s still relevant today. Why did you ultimately decide to take on Chess? 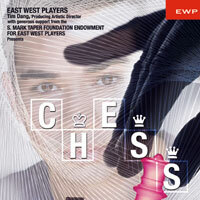 East West Players has never really done a show like this before, and I thought with the diverse talent pool we have, it was time to tackle something the size of Chess. We have incredible singers, and from talking with cast members, I think they would never have had the opportunity to play a role like this. In the mainstream world, some of the African American singers would only be cast in Smokey Joe’s Café or Dreamgirls. Our Asian American actors will get cast in Miss Saigon or Flower Drum Song. So to be cast in Chess, it’s great. I think there are also a lot of bi-racial performers now. Three of our actors are half-black and half-white; they have problems because they’re not black enough for the African American shows and they’re not white enough for the mainstream Caucasian shows. So to be cast in something because of who they are and not because of their type was very heartwarming to them. The idea for East West is to be vital and relevant in terms of subject matter and community. The community is very diverse now and we need to start evolving and opening up, because you know, Asians don’t live in a vacuum. That’s why I’m very happy with this particular cast. Some people might be shocked, like, “I can’t see an African American as a Russian,” so hopefully this can be an eye-opening thing for them. Or at least it’ll open up the conversation in terms of color-blind casting. You see Shakespeare being done diverse now. Why not something like Chess? The East West Players production of Chess runs May 9 through June 9, and features Wine Down Fridays, and a reception on May 15.